Windows Phone 9 and Windows 9 preview to release in 2015? A new report claim a Windows Phone 9 preview version, along with the same version for Windows 9 may release any time between Q2 and Q3 2015. Even as Microsoft is pushing its Windows Phone 8.1, a new version of the OS is already in the works and expected to be available by 2015. According to a leaked official document posted by Myce, Microsoft is planning preview releases for both Windows 9 and Windows Phone 9 in Q2 or Q3 of 2015. . If the document is to believed, the final release of Windows Phone 9 will be made by end of the next year. Windows 9 Preview version is expected to be available around the same time. It's notable earlier rumours had hinted the Windows 9 release in April at the next Microsoft Build Developers’ Conference. The new leaked document corroborates those rumours. 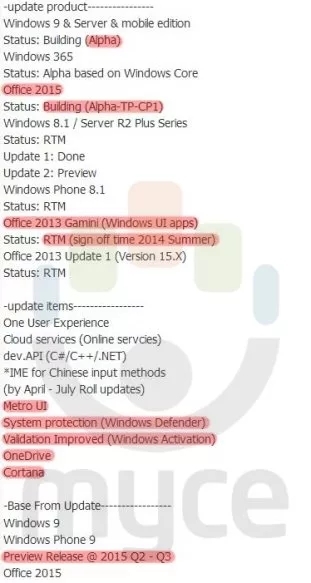 One of the highlights of the leaked document is the mention of “Windows 365”, which is also labeled as being in "Alpha based on Windows Core". Windows 365 is expected to be very similar to Office 365. Windows 9 is expected to bring a slew of changes to the Metro UI, Windows Defender, OneDrive, and Windows activation. There are chances Microsoft may include Cortana in Windows 9 as well. Microsoft recently launched the Windows Phone 8.1, which features personal assistant Cortana, notification center, more customizations and better security and enterprise features. Right now it's not known whether the Windows Phone 9 will support the current high-end WP devices. Earlier, Microsoft had rolled out Windows Phone 8 with new devices, while none of then WP 7 devices were updated to the new version.